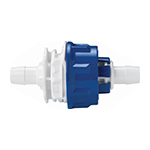 Colder Products Company (CPC) is the leading provider of quick disconnect couplings, fittings and connectors for life sciences, industrial and chemical handling markets. Used in a broad range of applications, connection technologies from Colder allow flexible tubing to be quickly and safely connected and disconnected, reducing spills and increasing safety. Connect with Colder for cleaner, faster, safer and smarter connections. For general air and fluid handling applications, engineers around the world choose CPC couplings because they’re easy to use and they simply get the job done. This broad portfolio features a variety of terminations, configurations, sizes and materials, as well as special design considerations like precise hose barbs, a thumb latch with an audible “CPC click,” non-spill technology that enhances equipment modularity and even optional RFID-enabled IdentiQuik® technologies can help you reduce product liability and increase device safety. No matter what your application requires, every CPC coupling is uniquely designed to deliver exactly what you need. Jerry cans, drums, intermediate bulk containers (IBCs)—you can use the DrumQuik® dispensing systems on virtually any container for safe, “closed” extraction of chemical or food-based fluids. With several dip-tube based systems of different sizes and materials, this solution minimizes the potential for potentially dangerous exposure while protecting your fluids themselves from contamination. 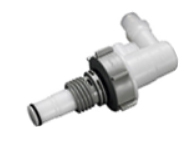 Fluid quick disconnectors are critical in liquid cooling applications. Thermal engineers demand drip-free solutions to keep the systems they design consistently cool. CPC’s liquid cooling of electronic quick disconnects (QDs) eliminate drips and withstand long-term use for safer, more reliable liquid cooling. With flexible designs that minimize flow restriction, dry disconnect capabilities that reduce spillage to near zero, resilient leak-free seals, easy disconnections and a variety of available materials, CPC is trusted by manufacturers for couplings in high powered supercomputers, data centers and even medical equipment. Bioprocessing, semiconductor and similar industries often require CPC’s rugged quick disconnect couplings and connectors made from high purity materials to transfer aggressive chemicals. These connectors are compatible with a broad variety of chemicals and they protect both workers and the environment from dangerous fluids. With optional RFID-enabled technology, metal-free construction, Viton® seals and other high purity features, helps you make chemical handling cleaner, faster, safer and smarter—one connection at a time. Clayton Controls is a CPC Colder Products distributor in California. We offer technical support to help our customers solve their applications.